Make it easy to maintain. Allow rich content and sub headers as well as standard links. Factor in frequent changes without involving developers or a lengthy Dev/Test/Prod release cycle. The personal assistant of the marketing boss should be able to make changes on the fly. Instantaneous. Without any knowledge of HTML or CSS, so editing code is out. If it’s more complicated than filling in a time sheet, it won’t fly. And do all that with just the browser interface and SharePoint Designer. No Visual Studio, no custom code. None of those take into account a SharePoint background, though. The MegaMenu content is always somehow “there already”, nicely configured in a nested construct of UL and LI tags, with hard-coded <A href> tags and titles. Not something the Marketing Assistant will want to get his head around if he wants to add a few items and a flashy “Hot and new” icon to a new menu entry. So, to achieve the vision and make the mission possible, we need to come up with some practicable steps. The CSS and jQuery script calls were originally posted at http://www.sohtanaka.com/web-design/mega-drop-downs-w-css-jquery/but this web site seems no longer available. Thanks to the WayBack machine, though, it can still be viewed in the Internet Archive and I have salvaged the MegaMenu Demo and placed a copy on my site. All credits for developing that demo go to Soh Tanaka. I also assume that you have a basic knowledge of the SharePoint 2010 browser interface , basic knowledge of SharePoint Designer 2010, Data View Web Parts (DVWP) and how to style screen elements with CSS. Have a look around and try out the demo to see what the end product should look like. Once you’re comfortable with the concept, come back and let’s take action. If we want the MegaMenu to be configurable, then a SharePoint List will be the most logical way to achieve that. For the sake of normalizing data, I suggest an approach with two lists. Title: — Single line of text – The MegaMenu tab title (if you use graphic files for the MegaMenu tab background, these won’t ever be visible, but they will help with the general orientation). Order – number – the order in which the headers appear on the final page. This column will be the first sorting and grouping criterion of the mega menu. The column will be inherited by the list that stores the MegaMenu details. CSSClass – Single line of text – This value needs to be manually created in the CSS file that formats the MegaMenu. Every header tab will have a specific width and position, defined by a CSS class. To make the formatting easier to maintain, assign the CSS class name here and then make sure that the CSS file actually has an entry that defines the properties for that class. The last two columns, MegaHeader:Order and MegaHeader:CssClass are created by ticking their column names when defining the Lookup column for MegaHeader. Now fill your list with some content. For each item, make sure you select a MegaHeader value and specify MenuRow, MenuColumn and ItemNumber. These numbers will influence the order of the items in a menu panel. Then specify at least one of the columns Title, MenuLink, ItemImage or ItemBody If a menu item has a Title specified, it will be formatted as a h2 element. A MenuLink for an item with a title is optional. ItemWidth is optional. Leave it at default unless you want an item to span more than one column. In that case, the first item in that column requires the ItemWidth to be set. In the new, empty data view, click the link to select a data source and select the list MegaMenu Content. It does not really matter which fields you select for the display, because we will gut the DVWP content and replace it with a custom XSL Template. So select a few fields and click “Insert Selected Fields as > Multiple Item View”. By default, the DVWP only shows 10 items. Fix that by clicking “Paging > Display All Items”. So, let’s apply the custom template. Find the first template in the XSL and delete all template code down to the last tag. Make sure to keep the opening tags intact. Note: If you want to use this XSL, I strongly suggest that you download MegaMenuXSLT text file with the code. When rendered in a web browser, some characters in the code may be replaced, resulting in faulty XSL. The biggest challenge was to figure out how to do the grouping in XSL. After several approaches, I found that the Muenchian grouping works best for my purposes. For each of the three grouping levels, I created filter keys that get progressively more complex, concatenating the header order, row order and column order. These keys are created above the first template. Since each header tab needs its own class assigned, I created variables that store the field CssClass for the current item and then concatenate that with the appropriate opening and closing brackets for the tag. The same technique is used later on to create the ul tag for the column, so the default column width can be overridden. With a default column width, we need a simple <ul> tag, but when a column width is specified with a 2, for example, then we need <ul class=”span2”>. Also, make sure that in the section for the #topnav you have definitions for each of the CssClass items you specified in the MegaMenu Headers list. I keep all my scripts in a Resource Library. The exact path to your script will be different, so please make sure to adjust the path. If you don’t use a Custom CSS file, you can load the CSS in that script as well. Now it’s time to test. If all goes well in the web part page, you can use the DVWP in your Master Page or a Page Layout. In this case, plug the script straight into the page instead of calling it via a CEWP. For the Master Page version of the DVWP I created a filter, so the DVWP will only display items where the column “Published” is checked. Now the marketing assistant can create new menu items in the MegaMenu Content list. He can check if all items behave by opening the Web Part page that has the single, unfiltered DVWP. If he’s happy with that, he can tick the “Publish” check box for the new menu items and they will appear in the filtered DVWP on the Master Page. No list or anchor tags are making it into the page. Can you tell me what I am doing wrong? it looks as if you meant to include an image or some samples in your post, but they did not make it. Please make sure that the list column names and the fields referenced in the XSL match perfectly. Before you apply the custom XSL, create a DVWP and make sure to set it to no paging and no filters. Does that render? Next, apply the groupings. Does that render? Next, replace the standard XSL with the custom XSL I posted above, without any style sheets. What does that look like? If it does not render as a nested UL-LI-UL-LI construct, please check your column names and either adjust the column names or the XSL calls to the columns. It looks like some code I posted got stripped out. I have tried several times, but every time I place the XSL in the code, it stops displaying the data. There are no errors in Sharepoint, just blank. It gets as far as a UL tag with id “topnav” but the tag is empty. I copied and pasted the names directly from your post just to make sure. I recreated the DVWP after that, which again outputs fine until I change the XSL. Question: should there be code like this in the XSLT: [html]&lt;a href=&quot;#&quot; class=&quot;[/html] ? 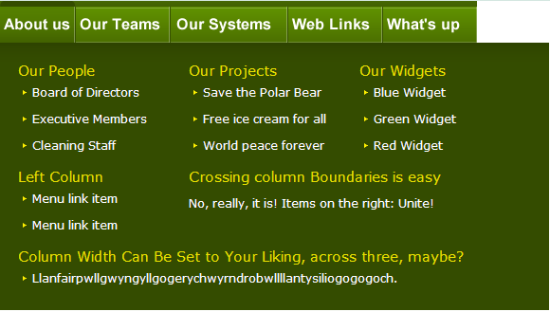 It’s all a bit confusing, especially since this blogging software will parse them as brackets again. I’ve edited your post to render them as you intended them to render. So yes, the XSL is meant to contain the [html]&gt;[/html] and [html]&quot;[/html] characters. With regards to your problems getting the code to run: make sure that the column names in your list and the column names used in the XSL match perfectly. XSL is case sensitive, so CssClass and CSSClass are not the same. I’m in the process of creating a .wsp file for download that can be installed as a solution. I’m just running into a few issue that I need to crack first. I’ve tried a few different solutions but I can’t get the hover intent to work. Any ideas or is there something I’m missing? make sure you have all the required jQuery files loaded. Adjust the sample script to reflect the versions and locations of jQuery and hoverIntent that you are using. Double check. I got the additional requirement to set the headers as links to subsites. for this I made two changes to the XSLand to the lists. First I defined a fourth column in the header list “Link” as one line of text. This field is looked up in the content list, too. Eckhard, many thanks for that tip. This is a great article! The only thing i see missing is security trimming. Do you have any input on this? I may try to put something together over the weekend. If you set fine-grained permissions on individual items in the Menu Content list, these items will only show in the MegaMenu for the people who are allowed to see them, so yes, security trimming is an option. Great menu! Trying to get it to work across multiple sites in the same site collection on a Publishing Site. The code seems to have to be overhauled in order for it to work with a web service. Has anyone done this yet? Hello Reuben, in my company’s intranet, the MegaMenu is embedded in the Master page, and all sub-sites inherit it gracefully. I have used this webpart in my master page. I have data source list in Top level site. But when i use this same master page in subsite it does not render. Is it due to the list not available in the subsite. When the menu is used on sub-sites, you need to refer to the contributing list slightly differently. Marc Anderson has detailed the approach here: . In the Select Parameters of the web part, get rid of the List ID and the other parameters and replace them with two parameters using the list name and the list url. That way you can refer to a data source up the chain. Is it possible to implement in MOSS 2007? Hello Victor, I don’t have access to MOSS 2007, but I see no reason why it should not work in that version of SharePoint. I have done all your steps, I added all scripts in the master page, and the css. Hello Mahmoud, troubleshooting SharePoint web parts that involve complex CSS and jQuery can be a bit daunting. Try to break it down into steps. First, configure the DVWP, without any CSS or jQuery in the mix. Once you see the nested list, apply the CSS. As a last step, apply the jQuery. Hi, thanks for this great solution. I’m really keen to get this working in a masterpage. Initially I’ve gone down the route of getting it working in a wiki page but am running in to difficulty and would appreciate some help! – Created 2 headers and a couple of items under each. – Uploaded the CSS to a folder in the style library and set the site to use it in the Master Page settings. – Uploaded the script to the same folder in the style library and modified the path. At this point all I see is the headings I created but no items underneath. It appears as if the CSS and jquery aren’t being picked up correctly as there aren’t any styles applied and nothing happens on hover. I viewed the source and checked that the relative URL resolves when I past it in my browser. I think I may not be added the classes correctly to the MegaMenuHeaders list. If I understand correctly the hoverintent also looks for these classes? I may have missed it in the article but I’m a little confused what to put in the CSSClass section and how it works with the lookup from the content list. I have tried #sub or sub or #row or row but I’m not sure I’m on the right track? I’ve made some progress! For some reason the .js files were coming through as blank when I view the contents in the MS Developer Toolbar. I don’t know why this is. I managed to get it working by putting the files in the 14 hive and referencing them from the wikipage I created the DVWP on. 2. Could someone please breakdown the steps to get this in a masterpage? Nice one!. Thanks alot for sharing this! Could you please give me the steps on how to incorporate this to my sharepoint 2010 online master page. Hello SBDDesigner, in the MegaMenu Contents list you need to create a column called MegaHeader. This column is of the data type “Lookup” and you need to point it to the MegaMenu Headers list. Then you need to tick the boxes for the fields “Title”, “Order” and “CssClass”. The “Title” field will be the main lookup field and the other two fields will be pulled into the MegaMenu Contents list as well. Thanks so much! That definitely helped. I have followed your other instructions but for some reason I am unable to get the hover to work. I have added the .txt file into a CEWP on the same page making sure the paths to my jquery.min.js and hover intent file are accurate to my folder location, also linked the style sheet into the page. When rendered and without the style sheet linked, I am seeing the unordered list with the and elements I added to the MegaHeader Content list, however, when I add the CSS, the LI’s disappear (as they shoud) but they do not reappear when I move my mouse over the header. What might I be missing? I appreciate any input you may have. Excellent work. Thanks very much for posting this article. Everything works flawlessly! This is really good work, can you explain what the ItemNumber field is for, it doesn’t seem to have an affect. The Item Number controls the order of the items inside the menu. The hierarchy is Row > Column > ItemNumber. 2. how to add a link to the “Home” (or any other) tab which does not contain any sub items. If you want to have a “Home” tab without a drop-down, just manually add the code for that immediately before the outer-most loop. Excellent teylyn, Great explanation, keep it up. I was able to implement all of it, one question though for some reason I’m not defining the lists properly so xsl is not generating classes properly, Do you mine posting the images of the lists ? I need both of them. thanks for the help. I’m in the process of creating a clean SharePoint install on a VM. If that succeeds, I’ll build the mega menu from scratch and post the WSP. I can’t promise an ETA, since I have a day job and a family. Thanks for posting this blog. I’m a newbie to SharePoint development. I’ve tried to follow your steps as outlined. I’ve created the lists and the DVWP per your instructions and they seem to be ok. However, I can’t get the css working. I am using the stylesheet you posted and reference it in the masterpage. It is being seen as I’m getting the green background colour. However, the headings are defaulting to other href settings. I’m assuming the problem is with the way in which I’m identifying the classes in the MegaMenu Header. Could you please tell me if I wanted to use the – ul#topnavlist a.FirstTab – how should I write this in the CssClass field? I’ve tried numerous variations but nothing seems to be working. I’d appreciate any guidance you could give me on this. The CSS file refers to images as background fills for the mega menu main tabs. You need to store these images on the server and reference them correctly in the CSS. Would it be possible to get the css, xsl, js and image files zipped up that you used for the demo. I am having the same difficulty as SBDDesigner with no luck. Hello Dave, I’m working on it. I cannot promise an ETA, but I’m hoping to build a clean VM and create a WSP file with everything included shortly, as soon as the pressures of my day job allow. Thank you Teylyn. I really appreciate your willingness to help me understand the whole pcture. Is it possible to create extra levels/layers to this Megamenu? I imagine it would involve creating a third and maybe even a fourth SharePoint list, rendering them in the nested list structure of the webpart XSL, and then changing the CSS a little? I’m a beginner, so if this is possible I’d appreciate a more detailed explanation of how I could do it. Thanks! I added 1 item to the Header list, using a CSS class of “topnav” because that’s what’s in your CSS. I included the script with a CEWP and pointed it to the correct JS files. I just get my single link without any styling. Not sure what to look for now. Hi, really useful, but I have made a couple of alterations to my version and pass these on in the hope that they will be of use. I needed to put a xsl:sort after each xsl:for-each to ensure that the required positions were obayed – otherwise I ended up with the items going into the drop downs in the order that they were entered (or modified). I then disabled the @title if there is an image and a link. Hello Rob, thanks for your comment. Unfortunately, any code or xsl you have posted did not make it into the comment, since the blogging platform strips out anything like code or html from comments. If you can email me the xsl, I can post it into your comment, so we all get the whole picture. My contact details are on the “About” page. Thanks for taking the time to share your approach. Thanks for sharing this. very useful. 1. Could you please give me an example of the content table? I’m trying to set the rows & columns values, and it doesn’t look as I expected. 2. I want a menu with 2 rows, each row has 3 columns, and another column shared to the 2 rows, with rowspan= 2, how can I do it? re (1): the list structure is described in the blog post. Just add a few items to the list and see how they behave when some fields have values and others don’t. re (2): The structure in the DVWP allows for colspan but not for rowspan. I don’t think that rowspan is possible, due to the way the DVWP XSL loops through each item. Save, publish and approve the new custom master page, then apply it to your site. If anything goes wrong, roll back to the out of the box v4.master page and get troubleshooting. Thanks for your quick reply.I am trying this in sharepoint 2013 online. Hope this will work with sharepoint online too. MegaHeader Lookup –>The lookup must be done with title field in the first list? MegaHeader:Order	Lookup–> The lookup must be done with order field in the first list? MegaHeader:CssClass	Lookup –>The lookup must be done with CSSclass field in the first list? Everything works fine but the jquery is not firing on hover i have referenced the jquery paths in master page and even tried with content editior webpart. but no luck your suggestions/help is appreciated. Hello, use Internet Explorer’s F12 key to fire up the Developer Tools. Check that all the jQuery libraries are loaded. You need the jQuery core as well as the Hover Intent. The paths in the above example lead to my favourite storage location for JS files: the Styles Library in the site collection. You may have a different storage location. Check the paths. I have custom jquey files which i have stored in my sites style library and given the correct path from my site.Still its not firing when i click site setting it seems the page lods twice. I don’t know your setup, version, edition and license of SharePoint. The jQuery version I posted above definitely works with SharePoint 2010 Enterprise on premise. It’s in production at my employer and many other sites. I’m sorry, but I don’t have the means or resources to troubleshoot this for you. The sharepoint version is sharepoint 2013 its on office 365. Great post , i was trying to make it work since morning, header menu are loading but not loading the child menu. Do you have any working files you can send me please?